where can I find the cubes? Where did you purchase the cubes from? I'd also like to know please! You can find similar cube end tables at NaturalWoodDecor.com http://bit.ly/1jgx5Dy. 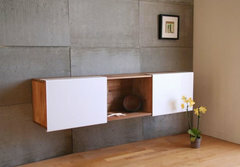 Here are some similar floating cabinets, hope this helps! 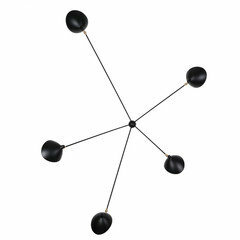 Less expensive serge mouille spider wall lamp five arms. Where can I find areas rugs with this type of print? I am having a hard time finding a contemporary design. is a good source for contemporary area rugs. Where can I find floor to ceiling drapes? Yes, please I would like to know too! Headboard - Is the headboard available separately from the bed frame? Thx. What is the color of the curtains? - Beautiful color! What is the exact color? What about the bench on the window wall? Love the easy look of it. Where can I find the wood boxes at the foot of the bed? These three blocky wooden stools form a bedroom bench. 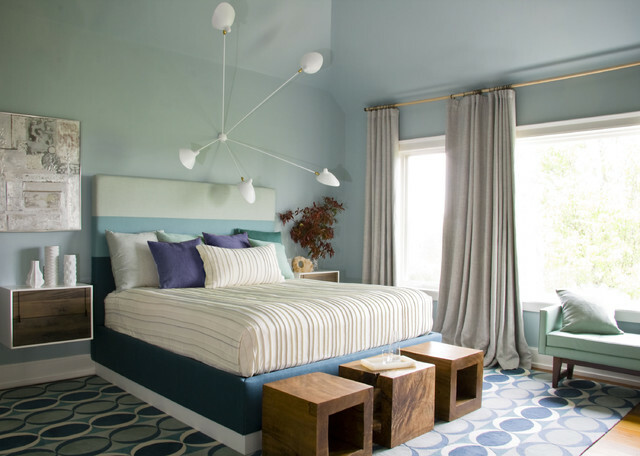 Same goes for these floating nightstands. Plus, with an (awesome) overhead light and a drawer or two for essentials, the tabletops are free for decorative touches. The unusual use of Serge Mouille's Spider Sconce in this room creates a sleek and modern look that is still extremely functional. The multiple arms allow for an array of light at several angles in the room, while also allowing for an adjustable reading light at night. Solid Powder Blue Accent, Throw Pillow Cover, 20"x20"